Use this guide to setup Payroll Manager to work with AME. 1. Entering the Duties Start Date. 2. Adding Pension Scheme details. 4. Adding Employees and setting pension contributions. 5. Sending letters to employees. 6. Producing CSV upload files to send to the pension provider. Every employer has a date from when the automatic enrolment duties come into force for their business. This is called the ‘Duties Start Date’. The duties start date is the date that an employer takes on their first employee(s). Click ‘Employer’ from the main menu, then ‘Employer Details’, then click on the ‘Auto-Enrolment pensions’ tab. Duties Start Date – enter the Duties Start Date in the first field on this screen (previously referred to as the ‘staging date’). Re-enrolment date – this box should be left blank at this stage. (Re-enrolment takes place 3 years after the Duties Start date). Defer/postpone until – this box should be left blank, unless you are using postponement for all of your employees. If this is the case then enter the relevant date. You should refer to The Pensions Regulator website if you require more information on postponement. Click ‘OK’ to exit this screen. Note: The bottom of this screen has a section headed ‘NEST’. Please ignore these fields completely, as they are only to be used with the NEST Pension Scheme. The tabs along the top of this screen allow you to add the details of up to 5 different pension schemes. Typically you may only use one of these tabs, but in cases where you have employees that are paid at different pay frequencies (e.g. some weekly and some monthly paid employees) then you should create a separate pension scheme within Payroll Manager for each pay frequency and name them accordingly (e.g. ‘AME weekly’ and ‘AME Monthly’). Click on the first available tab along the top of this screen. Name – Enter ‘AME’ (or similar) in this field. Reference – An optional field where you can add your own reference to appear on reports. You can leave this field blank if you wish. Provider type – Select ‘AME’ from the drop-down list. VERY IMPORTANT: When you first visit this screen the ‘No tax relief box’ is checked. It is very important that you determine the correct tax relief method for your particular pension scheme and select one of the following three options before proceeding, as this will affect the calculation of pension contributions. If you are unsure which option to select then please contact AME for advice. Basic rate tax relief at source -This option should be selected for pension schemes where the pension provider claims tax relief on behalf of the employee and adds it to the employee’s pension pot. Net pay arrangement -This option should be selected if the pension deduction is taken before the calculation of tax, so that tax relief is claimed via the payroll. Salary sacrifice/exchange -Salary sacrifice is an arrangement where a worker agrees to give up part of their salary and in return their employer pays it into their pension pot as part of their employer contributions. Because of this the worker receives a lower salary. If you have taken specialist advice and have decided to use a salary sacrifice scheme which meets HMRC requirements and complies with your employer duties then select this option. This pension has AVCs – Leave this box un-ticked initially. 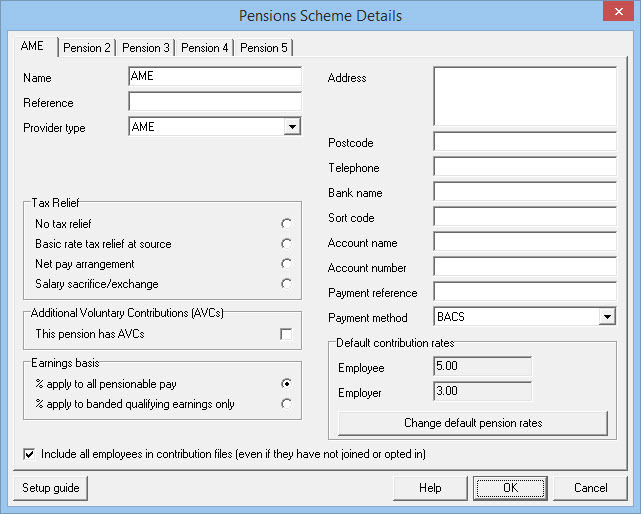 If at a later date an employee wishes to make an additional voluntary contribution to their pension (and providing that the scheme allows for this) then tick this box, which will create an extra column in the ‘Pensions’ section of the ‘Pay Details’ screen. % apply to all pensionable pay – If your pension scheme rules dictate that pension contributions are calculated on all pensionable earnings (i.e. from the first pound of pensionable earnings) then tick this box, otherwise leave it un-ticked. At the bottom-left of this screen is a box marked ‘Include all employees in contribution files (even if they have not joined or opted in’). You should leave this box ticked. The fields on the top-right hand side of the screen (Address, Postcode, Telephone etc.) are not used for auto-enrolment purposes and so can be left blank. If you wish to, you could record your pension scheme details here for reference. These are pre-set to whatever the current legal minimum contributions are, which for 2019-20 are 5% (employee) and 3% (employer). If you wish to set different default rates then click the button marked ‘Change default pension rates’, otherwise click ‘OK’ to save the Pension Scheme Details information. Note: Setting the default contribution rates on this screen does not automatically set the contribution percentages for each employee. You still need to enter the actual percentages individually on the ‘Employee Details’ screen (see section 4 below). Setting the ‘default’ percentage on this screen simply makes the process slightly quicker. The ‘Assessment’ procedure determines which of your workers must be automatically enrolled into the pension scheme and is dependent on the age and earnings of each worker at the point of being assessed. You should run the first assessment on your Duties Start Date, and then again on every subsequent pay period, to determine which employees need to be added to the scheme . Select the relevant pay period on the Pay Details screen. From the main menu click ‘Pensions’ and then ‘Assessment’. The ‘Layout’ selector at the top of the report allows you to display the assessment information in a number of ways (e.g. by Employee, by Category etc.). The ‘Category’ of each employee determines the next course of action. You should consult the guidance given by your pension provider and / or The Pensions Regulator if you are unsure how to proceed. In general terms employees categorised as ‘Eligible Jobholders’ will need to be automatically enrolled into your pension scheme, whereas ‘Non-eligible Jobholders’ and ‘Entitled Workers’ have the right to join if they wish. After completing the Assessment procedure you can then add the relevant employees to the pension scheme. 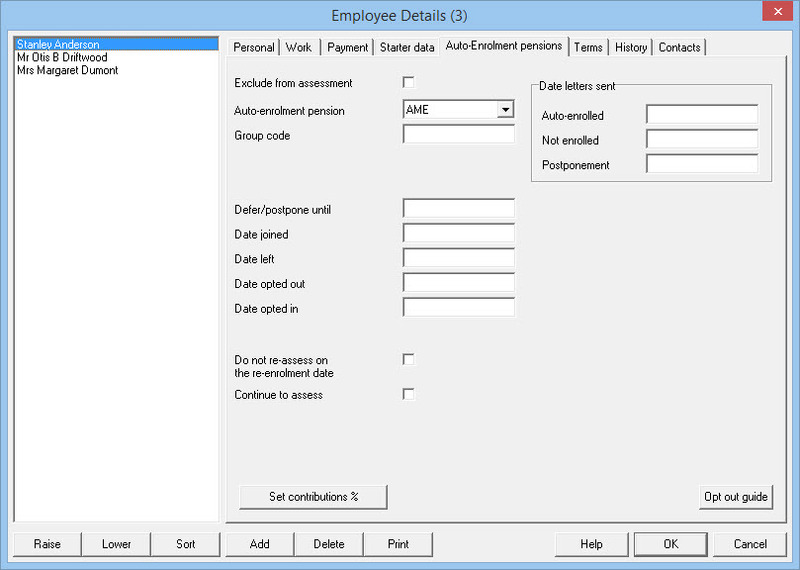 From the main menu click ‘Employees’ then ‘Employee Details’ then click on the ‘Auto-Enrolment pensions’ tab. The following details need to be set for each employee joining the pension scheme. If an employee is not joining the pension scheme do not complete any of the fields on this screen. Exclude from assessment – This box is un-ticked by default. If you have individuals on the payroll that are not deemed to be subject to Automatic Enrolment legislation (e.g. they are not ordinarily working in the UK) then you can exclude them from the assessment process by ticking this box. You should consult The Pensions Regulator documentation before selecting this option. Auto-enrolment pension – Select ‘AME’ from the drop down box. Defer/postpone until – If you are using postponement for an employee enter the deferral date here, otherwise leave this field blank. Date joined – Enter the date that the worker is joining the pension scheme – you must complete this field before you can set pension contributions for this employee. Date left – Leave this field blank initially – if the employee subsequently leaves the pension scheme then enter the leaving date here. Date opted out – Leave this field blank initially- if the employee subsequently opts-out of the pension scheme then enter the opt out date here. Date opted in – If the employee has been assessed as being a ‘Non-eligible jobholder’ but wishes to opt in to the pension scheme then enter the opt in date here, otherwise leave this field blank. Do not re-assess on the re-enrolment date – Leave this field blank at this point. Re-enrolment is a procedure which takes place 3 years after the Duties Start date and applies to employees that have previously opted out of the pension scheme. Employees that opt-out within 12 months prior to the re-enrolment date do not need to be assessed at this point – in which case you would tick this box. Continue to assess – Leave this box un-ticked, unless the employee has been assessed as an entitled worker and has then chosen to ‘join’ the pension scheme. In such cases you still need to assess them in each pay period to see if they become a jobholder. Tick this box in order to keep assessing such employees. 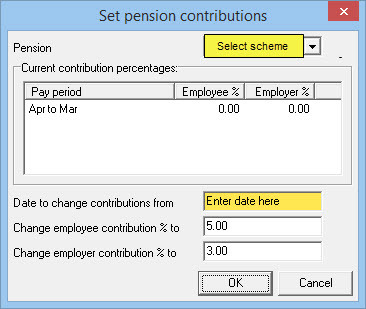 Set contributions % – Click on this button to set the relevant pension contribution percentages for that employee. (Note: in some circumstances you may wish to specify a fixed amount, rather than a percentage. In such cases you should ignore this button, and instead manually enter the amounts in the ‘Pensions’ section of the ‘Pay Details’ screen). Ensure the correct pension scheme has been selected, enter the date that you wish to set the contributions from (which is the first pay date on which contributions will be taken), make sure that the contribution percentages are set correctly, and click ‘OK‘. Payroll Manager will then automatically add these deductions to the ‘Pay Details’ screen. Leave these fields blank initially. Payroll Manager will automatically populate these fields as appropriate (see section 5 below – ‘Sending letters to employees’). Once you have finished entering the details of all employees joining the scheme you can produce a report which allows you to check that all details have been input correctly. Click ‘Pensions’ from the main menu and then ‘Employee Pensions Report’ to produce this report. 5- Sending letters to employees. Following the ‘Assessment’ procedure described in section 3 of this guide, you should communicate with each employee to inform them if they have been automatically enrolled into your pension scheme or not. The Pensions Regulator provides three letter templates for use when employees are being ‘automatically enrolled’, for those that are ‘not being automatically enrolled’ and those for whom you are using ‘postponement’. Payroll Manager has each of these templates built-in, to allow you to produce the relevant letter for each employee. From the main menu click ‘Pensions‘ then ‘Letters‘ and select the appropriate letter type. Select the relevant employee(s) and click ‘OK’. If you choose to print / save as pdf / email the letter to the employee then Payroll Manager will ask if you wish to record this fact in the employee’s record. The date will automatically be recorded on the Employees – Employee Details – Auto Enrolment Pensions’ screen, in the ‘Date letters sent’ section. AME allows you to upload csv files to their website to inform them of enrolments, employee details, pension contributions etc. Payroll Manager can produce these files for you. IMPORTANT: Most pension providers require that each employee has a ‘Title‘ (e.g.Mr, Mrs, Ms, Miss etc.) and a ‘Works Number/Payroll ID‘ entered in order for them to accept your csv file. Check that you have these items entered for each employee by clicking ‘Employees’ then ‘Employee Details’ from the main menu in Payroll Manager (Click the ‘Personal’ tab to view the ‘Title’ field, click the ‘Work’ tab to view the ‘Works number/payroll ID’ field). Make sure that you have the correct pay period selected on the ‘Pay Details’ screen, then from the main menu click ‘Pensions’ then ‘Generate upload files’ then click ‘AME’. The report shows which employees will be included in the csv file, together with their NI number, Pensionable Pay and Employee and Employer pension contributions. A representation of how the csv will ‘look’ is shown at the bottom of the report. Click the button marked ‘Click here to create the file’ to save the file somewhere (e.g. the desktop) on your computer. You can then upload this csv file to the AME website, according to their instructions. IMPORTANT: You should not use Excel (or any other spreadsheet software) to view your csv files after creating them as doing so may ‘reformat’ some of the fields causing AME to reject your file. If you experience problems when trying to upload your csv information then please contact AME in the first instance.